Today we woke up around 5:00 AM, ready to go. I wasn't really that ready to wake up but I was starving. I think I have jet lag of the stomach after this trip. My sleep hasn't been all that disrupted. 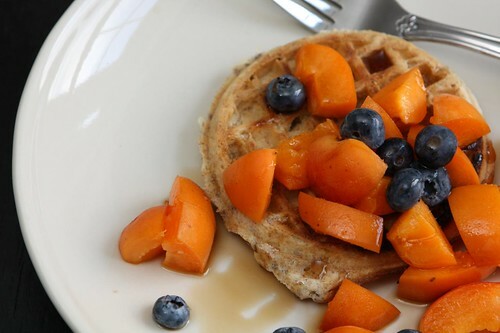 I made Jen some waffles with the farm apricots and blueberries. The apricots aren't quite as good as the ones we'd gotten in Switzerland but they're pretty good. This left us with only currants left from our fruit portion of the share this week. Still not sure what to do with those. Later this afternoon, for a snack, I made a spread by throwing some garlic, and Thai basil into a mortar and pestle and smashing them together with some almonds and canned pinto beans from the pantry. 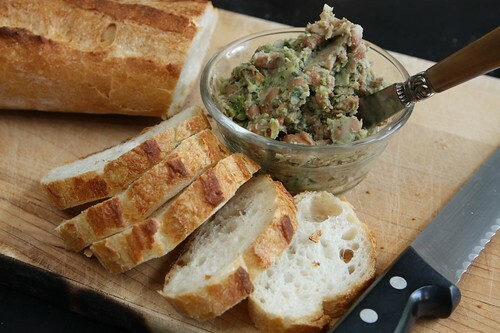 Without any additional oil this was a great spread for some sliced baguette. I must admit that I'd never heard of Aperol until our dinner in Zurich with Gregg and Ross. Ever since that dinner Jen was on a quest for Aperol asking in every restaurant we went to for the rest of the trip. Sadly no one ever had it. The only thing we really did today was to go out in search of Aperol and we finally found it at a liquor store down the street. 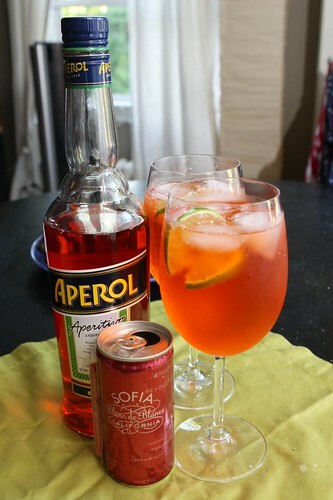 We made these spritzes with Aperol, lime, ice, and some Sophia Coppola champagne that Jen's sister brought back to us a few weeks ago. We'd given this to her at our wedding as a gift over three years ago and she had just decided she didn't want it. Her loss, our gain. Our sort of expired gain. 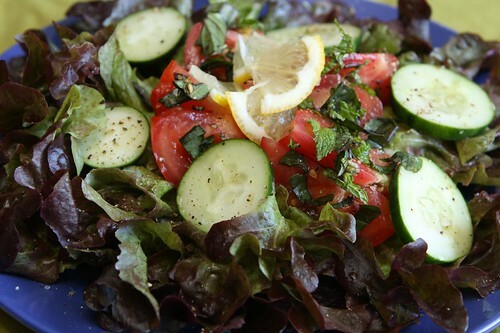 For a salad I used tossed some tomato wedges with mint and Thai basil then served them over the Solix Red Sail lettuce with some cucumbers, olive oil, salt, pepper,and lemon. 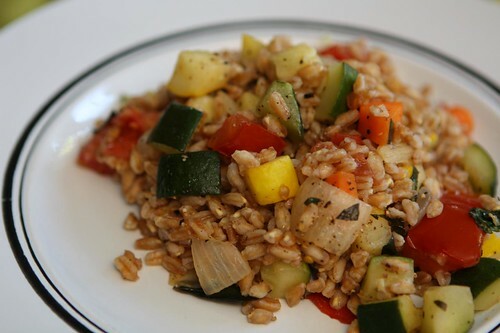 In a sort of replay of last night I cooked up some farro and tossed it with sauteed garlic, onion, carrot, summer squash, tomato, Thai Basil, mint, salt, pepper, and olive oil. We spent much of the day watching the highlights for all the Tour de France stages we'd missed while (ironically) we were in France. 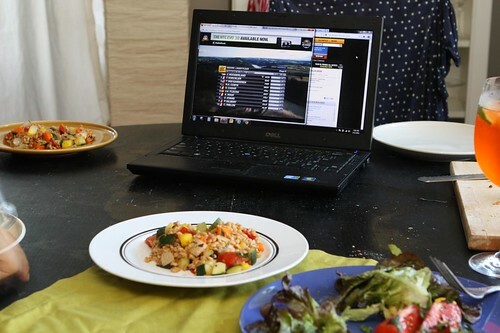 During dinner (and long after) we watched the Tour on our laptop. The All Access Pass is not perfect but it's great for those of you out there that don't have cable and want to watch the Tour de France. In America I suspect we may be the only two that fall into that very narrow category.